As mentioned in the Vanellope Von Schweetz review, the Disney store did a whole line of Sugar Rush racers. Sure enough, we're going to review them all! 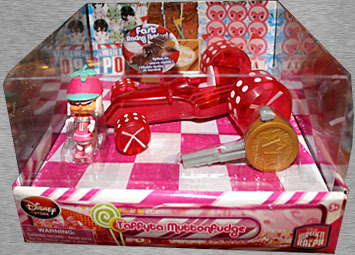 The lollipop-lickin' Taffyta Muttonfudge is a top-notch racer in the game Sugar Rush. She is a fierce competitor who keeps her eyes on the prize and isn't afraid to derail anyone who gets in her way. Though King Candy is Sugar Rush's racing champion, Taffyta always manages to give him a run for his money with her wicked driving skills. 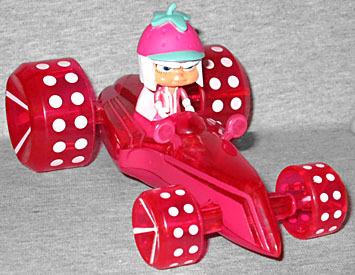 Taffyta, despite having a name that references taffy, fudge, and (for some reason) sheep-meat, is a strawberry-themed racer. She's dressed all in pink and white, making her the most "girly" of the racers, and wears a strawberry hat with minty green leaves on the top, and sculpted divots where the seeds would go. She has pure white hair, which seems weird, but is hardly the strangest thing we're going to see as we review these little buggers. Unlike Vanellope's mess of a kart, Taffyta's Pink Lightning has a clear theme - or, well, at least a translucent theme. That's a joke, son! 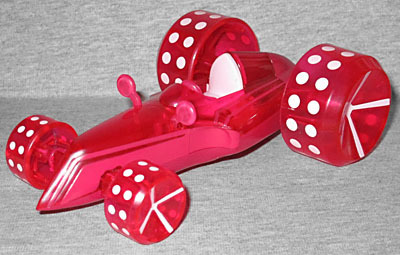 See, it's done like hard candy, so the top half and the wheels are molded from translucent pink plastic. The bottom appears to be normal opaque plastic, possibly so it's strong enough to stand up to the key-launching feature of all these toys. The shape of the car is very sleek. The front end is a very narrow point, and the chassis only gets wider where it absolutely has to - around the driver. Taffyta fits better in her driver's seat than Vanellope did, because her seat is more upright. You have to work her feet in under the tiny steering wheel, but she fits, and she can hold the wheel! The tires have white dots all along the surface, possibly something designed to give her more traction. The racer sets are sold in nice boxes that display the toys well. The entire top is clear, allowing full views of the car and the figure (as well as the golden coin key). The bottom of the display is pink and white checkerboard, showing the start/finish line, while the back shows some of the grandstands - the peppermints that want Adorabeezle Winterpop to win, the the teddy grahams that pull for Crumbelina Di Caramello, and Taffyta's own heart lollipops. This is a really lovely display, perfect for MOC collectors. Those weirdos. the wheels remind me of dice, though i'm not sure how that works with the candy theme.